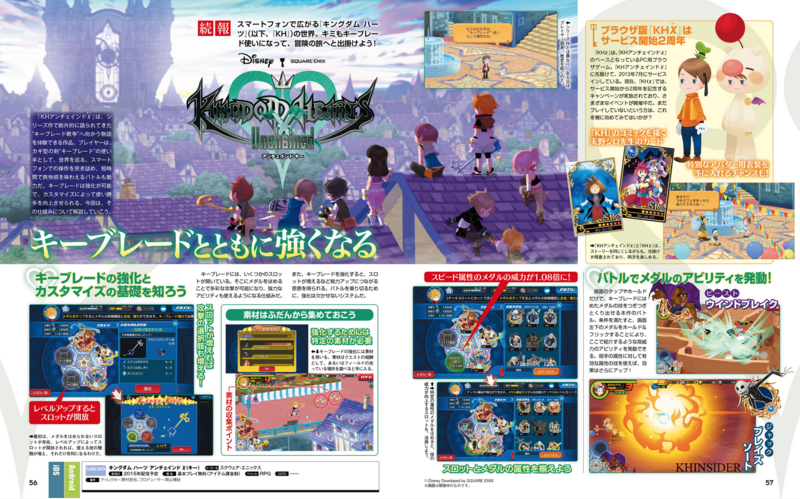 News ► Famitsu Details Kingdom Hearts Unchained X! Last week, Famitsu featured some new information on Kingdom Hearts Unchained X, as well as Kingdom Hearts X[chi]'s currently ongoing 2nd anniversary event. They talk briefly about the new Keyblade upgrade system, in which each Keyblade possesses several slots to be filled with medals in order to utilize powerful attacks and abilities, similar in a way to the materia system in Final Fantasy 7. Upgrading the Keyblade grants you more abilities and medal slots. Thanks to Chaser for the scans and Goldpanner for translations, you can view the new information below. The world of Kingdom Hearts (hereon KH) expands onto smartphones. Kingdom Hearts Unchained χ is a title that allows you to experience the ‘Keyblade War’ mentioned in-game in the KH series. As the wielder of the Keyblade, a key-shaped sword, the player goes around the worlds. The controls have been optimised for smartphones, and the battles that allow you to feel exhilarated in a short time are also attractive. The Keyblade can be strengthened, and the user-friendliness can be improved depending on customisation. In this issue, we’d like to explain the setup behind that. Become stronger along with your Keyblade! Keyblades have several slots open. The setup involves filling them with medals to open the possibility to use attacks and strong abilities. Also, strengthen the Keyblade and you will gain benefits that connect to your fighting power, such as increasing the number of slots. You can’t skip this element of gameplay if you want to overcome battles. Unleash the medal abilities in battle! In the battles in this title, you can unleash the techniques of the medals on your Keyblade one after another simply by tapping or holding the screen. Fulfill the requirements, and by holding and flicking the medal in the bottom left of the screen, you can set off powerful abilities such as the ones shown here. If you use a technique with an attribute that is effective against the enemy’s attribute there will be even more of an impact. Kingdom Hearts χ browser version service reaches second year anniversary! KHχ is the PC browser game that serves as the base for KH Unchained χ. As the predecessor of KH Unchained χ, it has been in service since July 2013. In KHχ there is currently a campaign to commemorate the second year anniversary of the service having begun, and various events are underway. If you haven’t played it before, how about taking this as your opportunity to try it out? D23 Expo is next month, TGS follows, and then D23 Expo in November so there are plenty of chances for them to finally reveal the date. I really like the new artwork, hopefully it will be released unobscured later. It may actually just be that some medals require different input, but I thought that, too and that'd be pretty cool if each medal has a different attack depending on how you touch it. I personally think it sounds a lot like The World Ends With You in terms of gameplay. Use round accessories to fight, unleash them by use a touch screen in different ways. Huh, you're right. I just beat that game, and this does seem pretty similar. I hope this works for the kind of phone I have. While I'm not a huge fan of mobile games, this sounds like a decent way to stave off boredom.